Under the Hood with Tekin powered Ryan Lutz – Tekin – Smaller, Smarter, Faster! So when asked what was Ryan’s favorite electric class ride to show off he didn’t hesitate to whip out his Tekin powered Team Durango Dex408 buggy. Let’s take a look at what’s “under the hood” of Lutz’s E buggy. Ryan chooses to run a Tekin T8 1900kv motor controlled by the Tekin Rx8 Gen2 esc. Powering up his Tekin system are a pair of Protek 100c 2s packs. Check out that fly white wire! Ryan learned everything he knows about clean wiring and beautiful soldering from Tekin team manager Randy Pike 😉 Look at that install job! As if Ryan wasn’t easy enough to spot roaming around the race track at well over 6 1/2 feet tall he runs his well known Blue/Pink paint scheme with AKA white wheels. If you ever get the chance make sure to stop by and say “hi” to Mr. Lutz. Be sure to check out Lutz RC, follow Ryan on Facebook, and catch his race reports here! 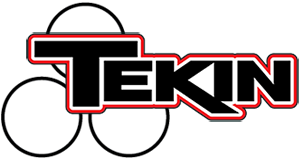 « Tekin Tq’s and Wins every Electric Class at the 1st Annual Silver Dollar Off-road Challenge!